This is a guide about Christmas cactus with red leaves. If the leaves on your Christmas cactus have suddenly turned red, it could be an indication that it has placed somewhere with too much light. It may also be lacking the proper amount of nutrients. This type of cactus prefers low light and direct sunlight should be avoided. I stopped watering my Christmas cactus for a long time (a couple of months?) and now the leaves are dark red and it isn't growing. Is there any hope that it is still alive? That has happened with me - one gets pushed behind something and gets dried out. I generally take my pot, place it in a bowl that will hold water about half way up the cactus pot and set it in my kitchen sink. Add plain water and let the plant soak up water for an hour or so. Just place in sink if it is a large pot. Trim about one-half of the "leaves" or more if very long and let pot drain for a while after soaking. Set aside and hope for the best. It will come back if you have not missed it too long. I try misting my cactus as much as watering and an ice cube once in a while is good also. Sometimes I take the cut off leaves, place on top of wet soil and put a light layer of soil over the cut ends and many times I am lucky and get startings from these. I feel sure there are many ways to try and save your plant so maybe you experiment with different methods. Good luck - I love my Christmas cactus. Water it and put it in a plastic bag. Blow some air into it and seal it up. It will get much-needed moisture. Cactuses are hard to kill and it does take a lot to kill one. I think you still have hope to save it now if you start taking good care of it. This will require you to get the roots good and wet. You can try soaking the roots with your garden hose, but the best bet is to place the pot in a watering try or drip try. You'll need to soak the plant and wet it as much as possible. Set it in the try and fill the tray with water. The roots of the plant will drink the water from the tray. Just keep filling the try with water. You'll also need to trim all the dead leaves off the plant to help it grow new leaves. I have 3 Christmas Cactus, one of them has ruby red leafs on the ends of it. What causes this? 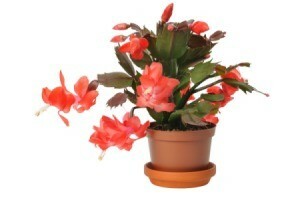 The red leaves on your Christmas cactus indicate that it has experienced some type of stress. This is usually related to a lack of nutrients and being exposed to excessive bright light (like being set outdoors in the sun). Leaves contain a flavonoid called Anthocyanin, which functions to provide the colors we see in flowers and fruit. In some plants, it is also thought to protect leaves from ultraviolet radiation. (In other plants, it's thought to repel browsing herbivores!) Leaves also contain carotenoids called Xanthophylls. These also help absorb and dissipate any damaging excess light energy that cannot be harvested by the leave's chloroplasts and turned into food. The red leaves on your cactus are an indicator that it has suffered sunburn. This could be from sudden exposure to excess light, or due to the fact that it lacks the nutrients necessary to help filter out the damaging ultraviolet light. Check to see that it isn't pot bound, which can effect the root's ability to take up nutrients. As long as it's not pot bound, a boost of fertilizer will probably be enough to turn the leaves back to green again. i do believe that is your bloom. I think the red leaves on your Christmas Catus is sunburn. I have mine in the south window, in the winter the sun is hot and the leaves get red. In the winter time they get green again.I think they are pretty that way. On mine, the new leaves are red and then turn green. Also, could be the blooms although I think you would know a bloom. The red ones are simply the young, immature leaves. Some varieties are a little redder than others. Once they grow larger and mature, they turn green. When yours blooms, you'll easily tell the difference between these leaves and the buds.